2. Adjust the interior temperature using the driver’s side or passenger’s side temperature control switch. In addition to the button/switch operations, you can control the climate control system from the On Demand Multi-Use DisplayTM touch screen. 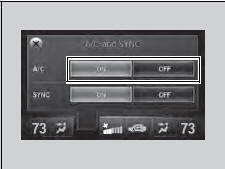 If any buttons/icons on the touch screen are pressed while using the climate control system in AUTO, the function of the button/icon that was pressed will take priority. The AUTO indicator will go off, but functions unrelated to the button/icon that was pressed will be controlled automatically. To prevent cold air from blowing in from outside, the fan may operate at low speed for a while after the AUTO button has been pressed. When you unlock the doors with your remote, the driver’s ID (Driver 1 or Driver 2) is detected, and the climate control settings are turned to the respective mode automatically when you set the power mode to ON. 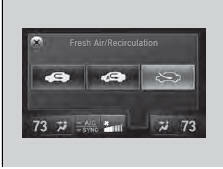 You can store two customized climate control settings to the system and recall them from the On Demand Multi-Use DisplayTM. 1. 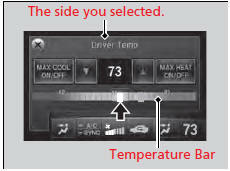 Select the driver’s or passenger’s side temperature control. 2. Change the temperature setting from the following: Temperature bar: Select a point where your desired temperature setting is. Farther to the left is for a lower, and to the right for a higher setting. : To raise or lower the temperature setting one degree at a time. While you select and hold , the temperature decreases or increases. MAX COOL ON/OFF: To rapidly cool down the interior. - The AUTO indicator comes on. The setting returns to the previously selected value when you select it again. MAX HEAT ON/OFF: To rapidly warm up the interior. When you set the MAX COOL or MAX HEAT, MAX COOL or MAX HEAT is displayed. 1. 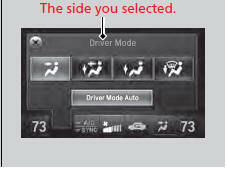 Select the driver’s or passenger’s side vent mode. 2. 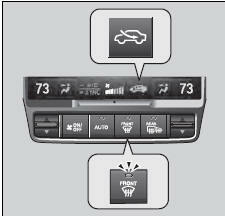 Select a desired vent mode icon, or Driver Mode Auto (driver’s side)/Passenger Mode Auto (passenger’s side): The system automatically selects the vent mode most suitable to the ambient environment. 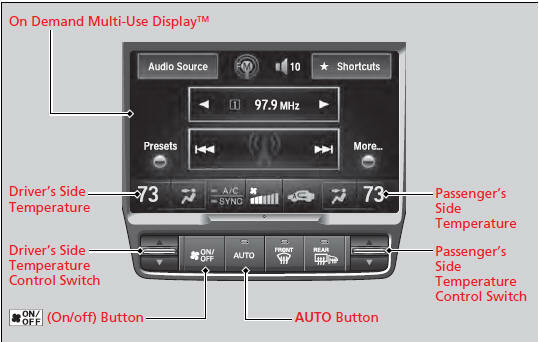 While the climate control system is in AUTO, Driver Mode Auto or Passenger Mode Auto is highlighted. 2. Select ON for synchronized mode, and OFF for dual mode. - When in synchronized mode, the passenger’s side temperature and vent mode become the same as the driver’s side settings. 3. Adjust the temperature or change the mode from the driver’s side. 2. 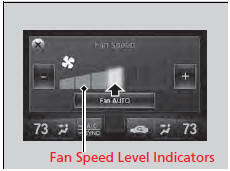 Change the fan speed with one of the following: The fan speed level indicators: Select your desired speed level. The smaller indicator is for a slower speed, and the larger for a faster speed. : To go up or down one level at a time. Fan AUTO: The system automatically selects the fan speed most suitable to the ambient environment. 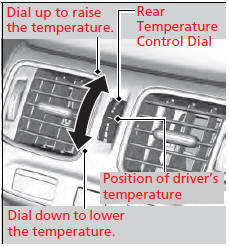 When the system is in dual mode, the driver’s side temperature and vent mode, and the passenger’s side temperature and vent mode can be set separately. You can also return to dual mode by changing the passenger’s side temperature or switching the vent mode. 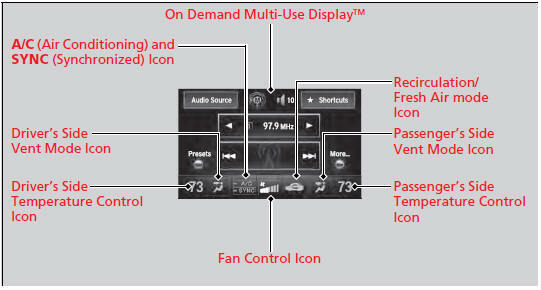 While the climate control system is in AUTO, Fan AUTO is highlighted. 1.Select , or currently shown. 2. 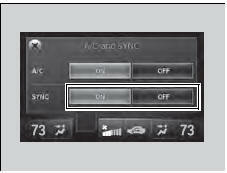 Switch the mode depending on environmental conditions to the following: (Recirculation Mode): Recirculates air from the vehicle’s interior through the system. (Auto Mode): Automatically switch between the recirculation and fresh air modes most suitable to environmental conditions. If the ambient temperature is low, the mode may not change to recirculation to keep the windows from fogging up. (Fresh Air Mode): Maintains outside ventilation. Keep the system in fresh air mode in normal situations. While the climate control system is in AUTO, is highlighted. 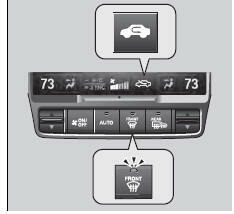 Pressing the button turns the air conditioning system on and automatically switches the system to fresh air mode. 2. Select the recirculation mode. After defrosting the windows, switch over to fresh air mode. If you keep the system in recirculation mode, the windows may fog up from humidity. This impedes visibility. You can set the rear passenger compartment temperature different than the driver’s, using the rear temperature control dial. The rear temperature can be adjusted when the Dial up to raise climate control system is on.